Crusty bread and scrumptious pastries at down-to-earth prices in central Riga. This journey will be a pleasure for the stomach and a delight for the senses, as the confectioner bakes sweet-smelling cakes and pastries in front of your eyes. 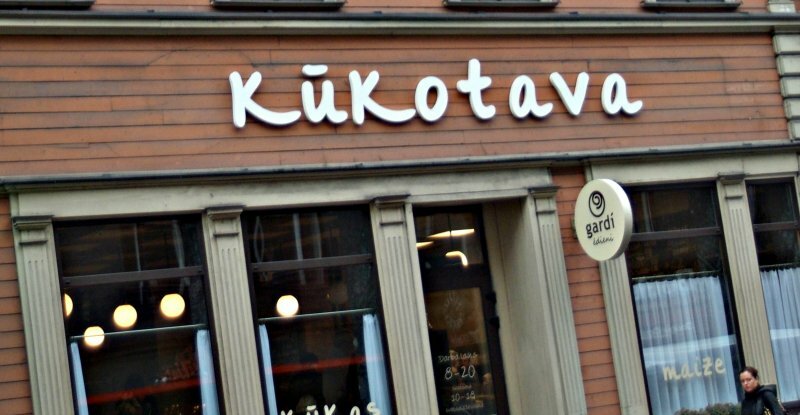 The Kūkotava bakery’s shelves are filled with freshly made bacon pastries, appetizing buns and artistic cakes. On our Sunday afternoon visit we turned up ravenously hungry. We started with buns filled with cottage cheese, though unfortunately the cheese was almost absent. Luckily our second try was much better; the cakes were not just good looking, they tasted sumptuous too, with rich chocolate on the outer edges and moist with a layer of berries inside. Kukotava owner Liene Tomsone is something of a chocolate guru as she has worked in the development of new products for local chocolate producers like the local confectionery giant Laima and the creative-minded Emila Gustava chocolate for many years. She decided to open her own distinctly personalized bakery to fulfill her sweet dreams, and not just the chocolate ones. She borrowed some of the recipes from her grandma, who was also passionate about cuisine. Even though this venue has been working for just few weeks, it has already become fashionable for the locals and we believe this trend will grow, especially as the weather gets colder.